Marta Borges Ordoño, PhD student under the supervision of Prof. Atsushi Urakawa (ICIQ) has defended her Thesis entitled “Insights into the co-catalyst effects in light-driven reactions for water splitting and carbon dioxide reduction” (assigned to the Inorganic and Physical Chemistry Department of the Universitat Rovira i Virgili) on October 25th at ICIQ’s Auditorium. The members of the evaluation committee were: Daniel Ruiz-Molina (ICN2), Guido Mul (University of Twente) and Jacinto Sá (Uppsala University). 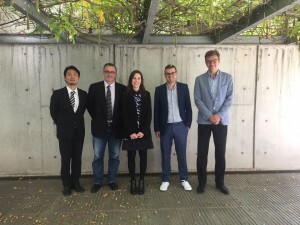 Dr. Borges with her supervisor, Prof. Urakawa, and the members of the evaluation committee. Dr. Borges was born in Olot, a beautiful city in the volcanic area of La Garrotxa and received her Chemistry Degree from Universitat Rovira I Virgili. In 2014 she obtained her Masters in Nanotechnology and Materials Science from Universitat Autónoma de Barcelona and in October joined Prof. Urakawa’s ICIQ group to work on heterogenous photocatalysis and in situ spectroscopy. Why did you become a scientist? What would you want to achieve as a scientist? I had an excellent chemistry and physics teacher during secondary education. I have been fascinated by science since then. I am concerned about our planet and energy resources, and as a scientist I would like to keep working on the renewable energies field and, in particular, on the understanding of catalytic processes. From the lessons learnt at ICIQ, which one do you value the most? The most valuable lessons come from my supervisor, Prof. Atsushi Urakawa, his experience, and support enabled me to grow as a researcher. I am grateful to him for the opportunity of pursuing my PhD studies here at ICIQ and for giving me the possibility of participating in conferences, where I learnt what other researchers in the field are doing and received valuable feedback on my work. What ICIQ moment you’ll never forget? After four years, it’s difficult to choose a precise moment at ICIQ. For sure, most of the good memories are related to lab colleagues and I’m certain we will remember those memories each time we see each other in the future! Where are you going next? What will you do there? I’m not sure yet what I’ll do after, but first I will celebrate the achievement of the PhD degree with my family and friends.